mad orange fools: The year in running. Is it really already January 10th?! Where does the time go? We haven't even been doing all that much, and the days sometimes seem to go on forever, but still, somehow, time passes so quickly. I have posts to write. The New York trip. The ear surgery. The year in review, kind of. But I can't seem to get myself to do any of it. I'm not particularly motivated and focused right now. Not always the best place to be, but not the worst either. I'm learning to accept that there are times like these, when maybe I read or knit or watch movies all day instead of constantly taking care of business. (Or whatever you want to call it.) And the cold weather certainly doesn't help. I am not a big fan of low temperatures under 10 degrees. But anyway, the year in running. I am really quite thrilled that I got so much running in last year. I ran almost 400 more miles than I did in 2011. 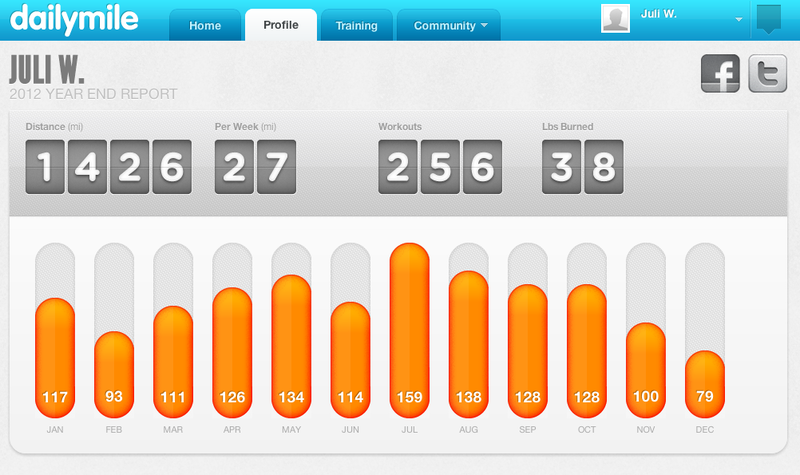 And no, there's no point to this goal of running more, really, but it makes me feel good. (I mean, I am not training for a race or anything specific like that.) And I hope to continue on in a similar way this year. Not with even more miles but with about the same. And with more long distance running when it warms up again. I think I am already behind since I've missed a few days this year and had some shorter than usual runs due to icy and freezing cold conditions. I guess it wasn't as cold last year? Or maybe I was tougher? I don't remember. But it's okay. While I am obsessive about running, it is not something I beat myself up about. If I have to miss a day, so be it. At any rate, when I think that maybe I didn't accomplish much in 2012, I can whip out this chart and remind myself that it was an excellent running year for me.